Tropical Storm Katrina is shown here as observed by NASA's QuikScatsatellite on August 25, 2005, at 08:37 UTC (4:37 a.m. in Florida). At this time, the storm had 80 kilometers per hour (50 miles per hour; 43 knots) sustained winds. The storm does not appear to yet have reached hurricane strength. The greater danger may be not with her winds, but with Katrina's rains. The storm is moving slowly, just 13 km/hr (8 mph), and is expected to slow as it moves over land. This means that Katrina 's heavy rains will linger longer over one area, dumping 15-25 centimeters (6-10 inches) of rain over Florida and the Bahamas and possibly up to 38 cm (15 inches) in some regions, the National Hurricane Center warns. Tropical cyclones (the generic term for hurricanes and typhoons) and to a lesser extent, weaker storm systems like Katrina, are difficult to measure. 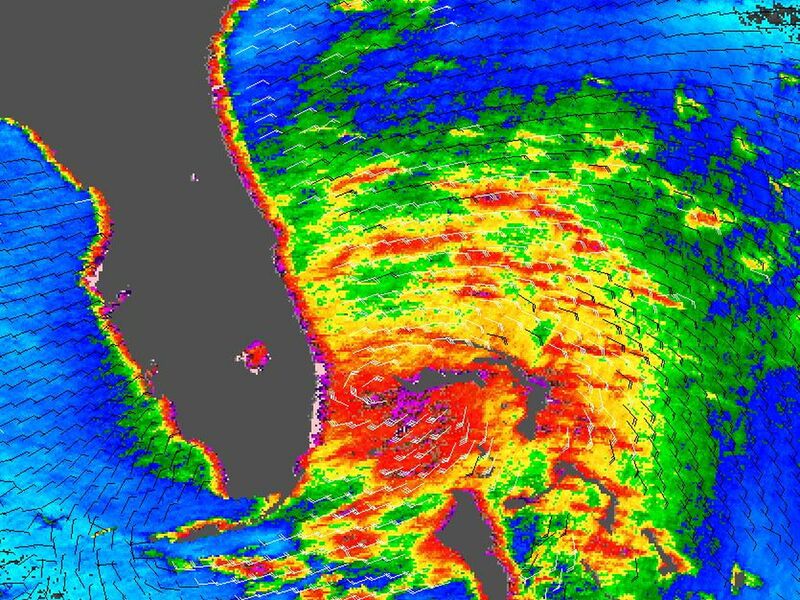 To relate the radar energy return to actual wind speed, scientists compare measurements taken from buoys and other ground stations to data the satellite acquired at the same time and place. 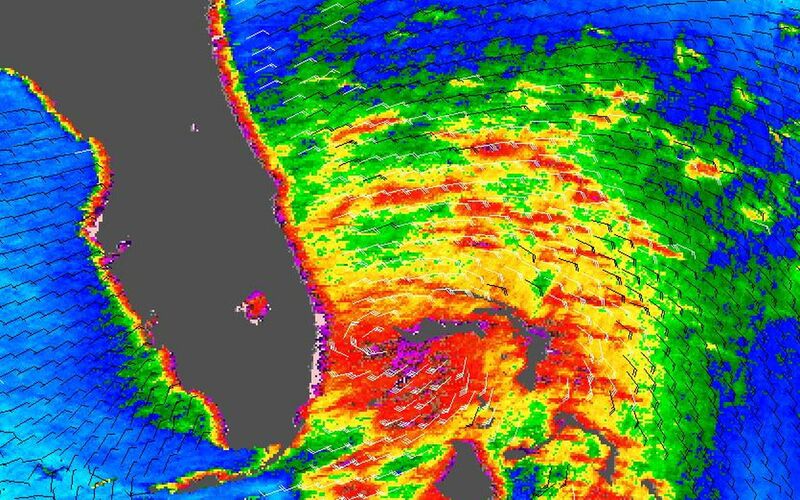 Because the high wind speeds generated by cyclones are rare, scientists do not have corresponding ground information to know how to translate data from the satellite for wind speeds above 50 knots (about 93 km/hr or 58 mph). Also, the unusually heavy rain found in a cyclone distorts the microwave pulses in a number of ways, making a conversion to accurate wind speed difficult. 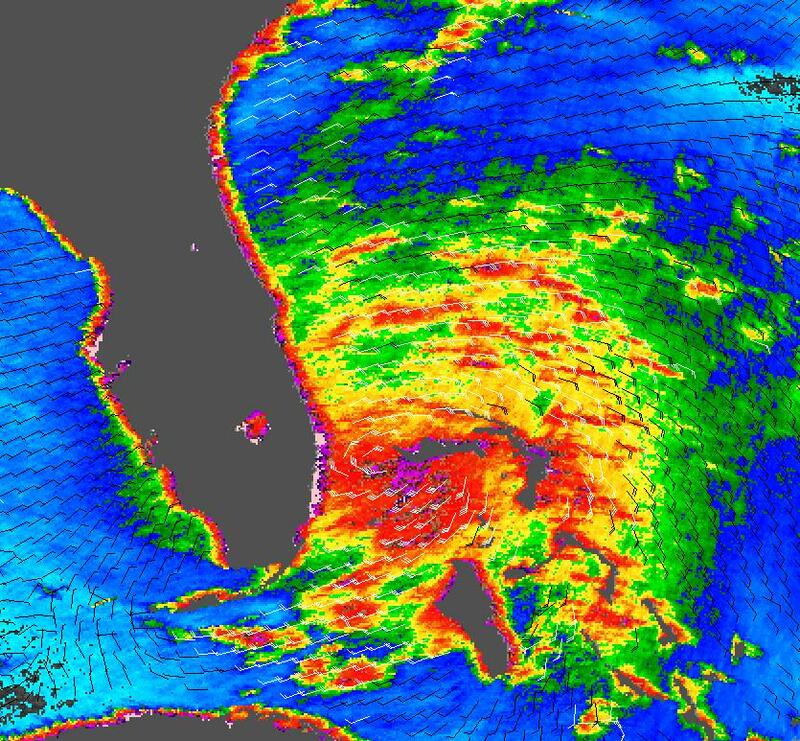 Instead, the scatterometer provides a nice picture of the relative wind speeds within the storm and shows wind direction. NASA's Quick Scatterometer (QuikScat) spacecraft was launched from Vandenberg Air Force Base, California on June 19, 1999. QuikScat carriesthe SeaWinds scatterometer, a specialized microwave radar that measures near-surface wind speed and direction under all weather and cloud conditions over the Earth's oceans. More information about the QuikScat mission and observations is available at http://winds.jpl.nasa.gov. QuikScat is managed for NASA's Science Mission Directorate, Washington, DC, by NASA's Jet Propulsion Laboratory, Pasadena, CA. JPL also built the SeaWinds radar instrument and is providing ground science processing systems. NASA's Goddard Space Flight Center, Greenbelt, MD, managed development of the satellite, designed and built by Ball Aerospace & Technologies Corp., Boulder, CO. The National Oceanic and Atmospheric Administration has contributed support to ground systems processing and related activities.